With vzaar’s YouTube syndication, you can take the pain away from uploading your videos in two locations. This feature is suitable for those who wish to take advantage of the wider YouTube audience. YouTube syndication is designed to copy your vzaar uploads onto YouTube. Whenever you upload a video to vzaar, you can choose to have the same video automatically uploaded to YouTube. 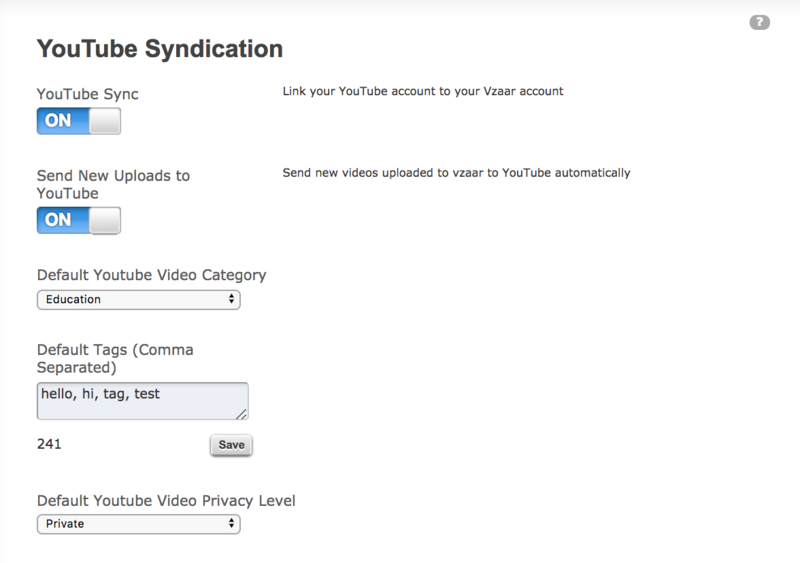 Also, YouTube syndication will allow you to send your existing vzaar videos to YouTube. Go to your vzaar encoding settings and scroll to the bottom. Turning the feature on will open a new window where we request permission to upload files on your behalf. Click ‘Allow access’. Once authorized, you will be returned to your vzaar settings. Make sure the ‘Send New Uploads to YouTube’ button is set to ‘On’. Choose your Default Youtube Video Category, Default Tags (Comma Separated), and Default Youtube Video Privacy Level. You’re done! All future uploads will now be automatically mirrored on your YouTube account. YouTube Syndication is currently available in both the Advanced and Premium feature sets. Please contact sales to learn more.